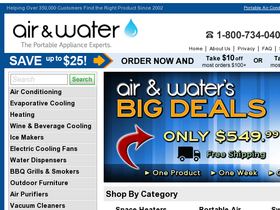 Air & Water, online at Air-N-Water.com, is one of the largest appliance retailers out there. Air & Water offers heating and cooling equipment that is reliable and effective. Choose from a selection of fans, humidifiers, dehumidifiers, vacuums, air purifiers, air conditioners, and water dispensers at Air & Water. Air & Water has options for every room in your home or office, and guarantees your satisfaction. Make your life more comfortable -- check RetailSteal.com for Air & Water coupons, Air & Water promotions, and Air & Water coupon codes, and shop today. Get free shipping on select items. Air & Water ships via FedEx to the contiguous US, Alaska, Hawaii, Canada, Puerto Rico, US Territories, and some APO addresses. If you would like refund, return product within 30 days of purchase date. See website for full details (certain exclusions may apply). Shop at Air & Water and enjoy $10 savings on orders $100+. Click here for code. Shop at Air & Water and enjoy 30% savings on air purifiers. Click here for code. Shop at Air & Water and enjoy 10% savings on most items. Click here for code. Shop at Air & Water and enjoy 10% savings sitewide. Click here for code. Shop at Air & Water and enjoy 10% savings on select items. Click here for code. Shop at air-n-water.com and save 12% off your entire order. Click here for code. Visit air-n-water.com and save 15% discount with promo code.